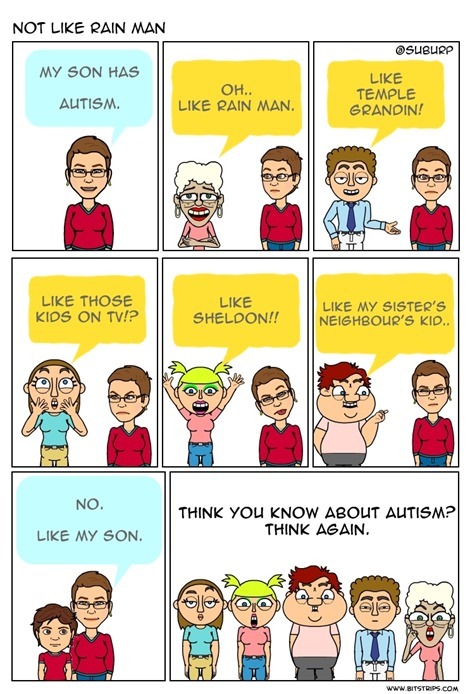 What people know about autism..
People are generally AWARE about autism, don’t you think? They still have a lot to learn. Let’s do this. This entry was posted in autism, general, parenting and tagged ASD, asperger, autism, children, information, opinions, parenting, prejudice, school on September 18, 2013 by starfish. I have never associated health conditions, be it mental or physical, with people or characters (I know a lot do though). I am definitely guilty of having preconceived misconceptions of Autism – just because I had never needed to concern myself with the details. I am thankful that my quirky boy is giving me the opportunity to challenge them every day. You can’t help but love him and all that he is and isn’t.